Celebrating a special occasion and need a cake to complete it? 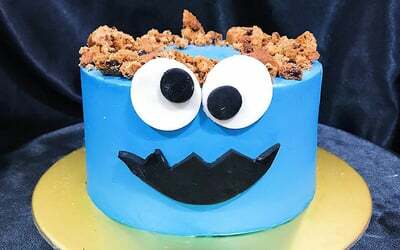 Indulge in a sinfully delicious cookie monster cake of either coffee flavoured or cookies and cream. So satiate that sugar craving of yours and grab your cake today! Beautifully crafted, this cake practically melts on the tongue! Valid for pick up Mon - Sat: 11am - 6pm. Closed on Sunday. Not valid on public holidays. Delivery rates are based on distance and ranges from $25 - $30 island wide in Singapore. Rates will be advised upon writing in. Last delivery time is at 8pm. Reply from Pink Maison in email form is required as proof of order confirmation.